The Dorflinger is a truly classic cocktail. It's one of those drinks that has a fascinating, unique, and complex flavor that you wouldn't expect from just three ingredients. The beauty of this recipe is that Plymouth Gin and absinthe are two equally bold ingredients that actually work wonderfully together. The gin is full-bodied and has hints of fruit within the botanical notes. When paired with the strong anise flavor of absinthe and the final accent of orange bitters, you're left with an intriguing taste of old-school cocktails at their best. This cocktail got its start in the days before Prohibition. It was most likely named after the famed glass maker, Christian Dorflinger. Dorflinger was from White Mills, Pennsylvania and known for crafting fine glassware during the "brilliant period" including—rather fittingly—drink containers. In a cocktail shaker filled with ice, pour the gin and absinthe. How Strong Is the Dorflinger? It's always best to enjoy absinthe drinks in moderation, even limiting yourself to one per night, because it's a rather potent distilled spirit. 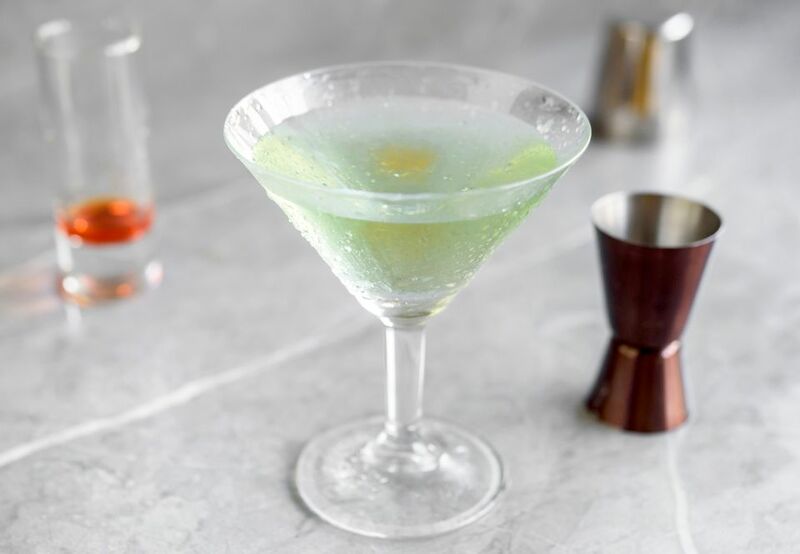 Absinthe is often bottled at hefty 45 percent ABV (90 proof)—though it can be much stronger—and this recipe pours a significant amount of it. Plymouth Gin is 41.2 percent ABV (82.4 proof), though there is also a Navy Strength available at 57 percent ABV (117 proof). These numbers should indicate that this is not, in any way, a weak drink, especially since they're the only ingredients in a Dorflinger. On average, with standard Plymouth Gin, this one has an alcohol content around 36 percent ABV (72 proof). If you pour the stronger versions of either liquor, you will exceed the strength of a straight shot of the average whiskey, vodka, or tequila. That's one of the reasons the Dorflinger is poured as a 3-ounce drink, which is actually double the average shot. The Dorflinger is not the only classic cocktail to play up the pairing of gin and absinthe, though it is one of the few that uses Plymouth Gin. The duo makes an appearance in a number of timeless recipes and, more often than not, absinthe's strong flavor is used as a more delicate accent. Corpse Reviver No. 2: Just a dash of absinthe is added to the gin version of the classic corpse reviver. This is a recipe every cocktail connoisseur should try at least once. French Pearl: Plymouth Gin and absinthe are together again in this fun cocktail that's rather unusual. That pairing is accented with fresh mint and lime, along with rock candy syrup. Monkey Gland: There is an interesting story behind this drink's unusual name, but don't let it detract you from trying it. The recipe rinses a cocktail glass with absinthe, leaving only the essence behind to flavor the sweeter taste of gin, orange juice, and grenadine. It's delicious. Obituary Cocktail: A twist on the classic gin martini, this cocktail adds absinthe to the combination of gin and dry vermouth. It's invigorating and intriguing, the perfect choice for anyone who enjoys drier cocktails. Tuxedo Cocktail: While you can use any anise liqueur in this classic recipe, absinthe is a great choice. Building on the famous combo of gin and dry vermouth, it adds maraschino and anise to the mix. The complexity is wonderful and it's another cocktail you won't want to pass up.